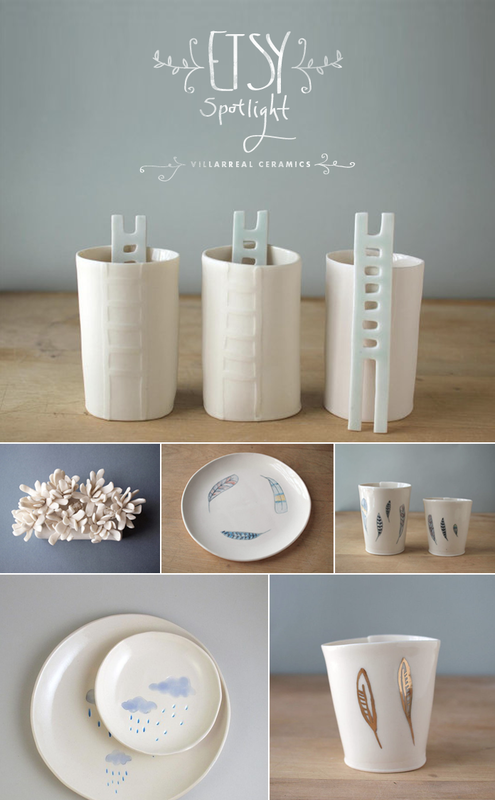 This week’s Etsy Spotlight is on Villarreal Ceramics. I have been a fan of ceramics since high school. I remember how hard it was for me to really figure out the wheel and then to make the pottery look the way I wanted with the paint and everything. It just mesmerized me to see people create beautiful pieces of pottery and mine always looked like a kindergarten art project. So when I came across Villarreal’s work I was totally in love with the whimsy, simplicity, clean lines, and the orgranic shapes. I love how every piece is white with the little whimsey touches. It makes me super happy when I see her work and really have debated about purchasing some the glasses when we get into a serious space one day. So fun. Make sure to check out the shop and blog to keep up with fresh items and what is happening in the studio. Happy Tuesday friends! I have been pretty under the weather…think I have gotten a little summer flu so I am headed back to bed and may post later this evening.